I’ve been working on this post for a while, not quite sure how to whittle down what I’m thinking into a cohesive piece. What I’ve decided to do is use this as sort of a conversation starter and discuss some points further in their own posts as warranted. Over the years I find myself more and more frequently in the unusual position of being a more experienced player than some of my musical co-conspirators. It’s forced me to think long and hard about what that experience has taught me, what I might pass along to a younger player if asked. I enjoy music most when played with others – it’s probably why I don’t practice nearly as much as I should. As I have said before, I believe I’m a stronger ensemble player than a soloist. For a player in a band or ensemble of any kind, this element of musicianship is a much more important quality than talent. So without the benefit of that musical education, what would someone need to do to make the transition from casual jams to a band? We’ve all sat around the campfire, enjoying someone playing guitar, only to have the whole thing fall apart when a second guitarist or (heaven forbid) a drummer enters the mix. Whether it’s ego or insecurity, some players are so focused on what they are doing they cannot hear or feel how it fits into the whole. There is so much more to musicianship than just being able to play your instrument. A little time spent focusing on the following aspects of playing will go a long way to improving that campfire jam. These are just some random and generic bullet points that could apply to any player. Learn lots of simple songs. They can help form the building blocks you’ll need to play harder stuff. Learn the underlying concepts of harmony, rhythm and form in each song. You’ll be amazed how frequently they will reappear in another song. Look around, make eye contact, see if anyone is trying to cue you to do something different. Be open to suggestions and criticism. Don’t take it personally. Know when to stand out and when to support. If you don’t have a lead, do something complementary or contrapuntal, or just find a simple pattern to vamp on. Don’t compete for attention when it’s someone else’s turn. Sing only if you know the words. If you’re singing harmony, try to match the phrasing and style of the lead. Paying attention to dynamics (not just volume, but also crecendos and accents) will instantly set you apart. Serve the song. You don’t need to use the whole box of crayons on each and every picture. I’d love to hear what you think. What do you think is important for musicians seeking the proverbial “next level” of musicianship? Some of these ideas, yours and mine, will be fodder for future posts. Go Smitty! It’s Your Birthday! 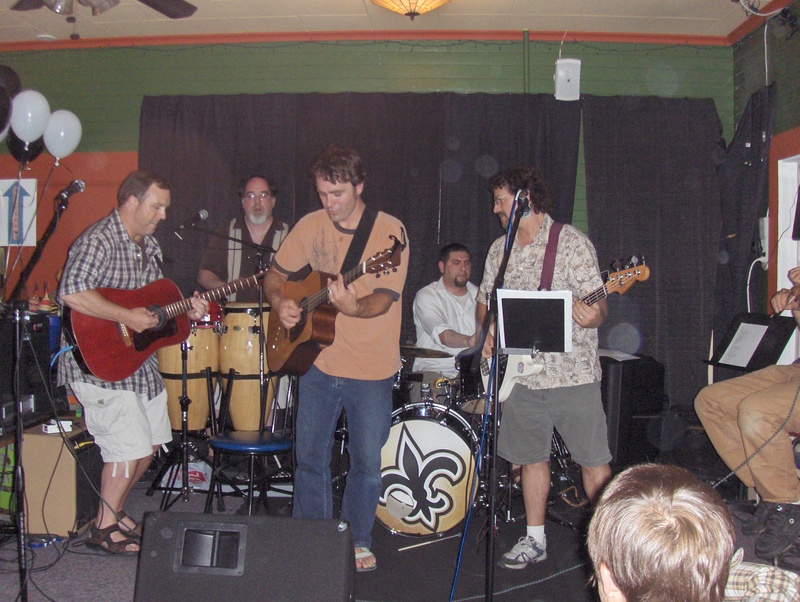 Here’s a picture from Mystic Canyon’s most recent gig at the Sellwood Pub. We had a great time celebrating our guitarist Mike Smith’s birthday last Saturday with some fun jams, great friends,and quality tequila shots. The knees to the right belong to fiddler extraordinaire Alan Glickenhaus, a Portland music icon with whom we have been honored to share the stage a few times. Next up: We return to the 9 Muses Tavern on Friday, September 26. I’ve spent a lot of time lately thinking about who I am as a musician, and what can I offer the world that no one else can. This blog will be an outlet for ideas, advice, reminiscences and eventually, you know, actual music recordings and maybe even videos. But before I go shooting off at the mouth, I’d like to tell you what I think gives me the right. My musical path has been unusual but deeply satisfying. I think most high school band geeks eventually settle on one of three fates: Pursue their training further in college, give up entirely when the real world beckons, or find a happy medium and join a rock band. Somehow I managed to fulfill all three of these destinies. I got my Bachelor of Music from DePauw University in 1992. Music Business was my major and trombone was my axe. My college years revolved around performing in any ensemble I could: Concert and Marching Band, Choir, Jazz Band, Brass Quintet and eventually, as my playing improved, the DePauw Symphony. These were top-notch groups with great players, many of whom went on to sing or play professionally. It was there in Greencastle, Indiana where I honed my ability to listen to my fellow musicians, to read and react. These ensemble skills are the bedrock of my musicianship, much moreso than actual talent. 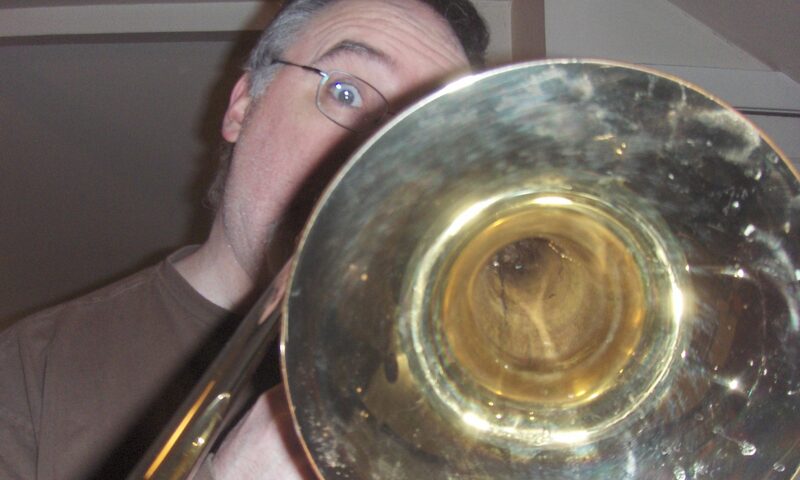 In fact, by the time I graduated, I had accepted the fact I lacked the chops to ever be a professional trombone player. In my final semester, just for the hell of it, I took drum lessons and discovered that my true calling was rhythm. I’ll never forget the look of astonishment on the face of Pat Reynolds, my band director, when he heard my first drum jury. After years of hearing me struggle through uninspiring trombone juries, his expectations must have been pretty low. Making such a positive impression on him from behind the drum kit was a thrilling affirmation. My development as a musician was put on hold for several years after college as I tried to focus on the Business part of my degree. I tried to stay close to the music world with jobs in music retail and entertainment marketing, but was very disheartened by the commodification of art. I began to harbor a deep resentment of radio and MTV, trying to feed me what their demographic analysis told them I should want, and an even deeper appreciation for art created outside of that bubble. Phish became a religious experience for me, having grown from a college curiosity to a national phenomenon with little influence from the machine. Before long I was once again surrounding myself with musical people. Only now they were not music students but working folks who were finding the time to create something special. While they may not have had the same discipline as me, they more than made up for it with passion, talent and creativity. For a few years I lived and breathed music that relatively few people had ever heard, soaking up inspiration from bootlegs of Phish and God Street Wine concerts, and seeing bands I had befriended like thE otheR waY, Three Hour Detour, Kid With Man Head and Burning Bus. All without playing a single note or beat. I bought my first congas, which I still play today, from Ray Ashley in 1996. Before leaving New Jersey four years later, I collaborated with friends on a few short-lived rock bands, the 9-Volt Smoke Detectors and Go Banana! Soon after arriving in Oregon I was introduced to Scott Hewitt (by a mutual Jersey friend, naturally.) I accepted his invitation to play with some friends in his backyard, and the musician in me was reborn. Seven years later, Mystic Canyon still brings me much joy and satisfaction, combining the discipline of my formal education with my passion for the creativity of my friends and my love of music that has thrived outside of the commercial influence of the music industry. The lessons I’ve learned in this band are as profound as any I learned in college, and will be the subject of future posts. I just figured, when you read them, you’d like to know where I’m coming from.